by marc / Thursday, 21 March 2019 / Blog Category: Everything Vegas and Food. Forbes Travel Guide inspectors have been researching the best hotels, restaurants, and spas around the world for 61 years. This is not a fly by night list. Forbes visited almost 1,700 properties around the world to come up with their rankings. The travel guide lists the best of the best amenities inside hotels around the world. The very best restaurants received a 5-star rating. The second best received a 4-star rating. Restaurants that receive a “recommendation” would probably be considered a 3-star rating. This year, Las Vegas has 21 restaurants that received at least a recommendation from the Forbes Travel Guide. Six of the restaurants received the highly coveted 5-star rating. One casino in Las Vegas is home to more ranked restaurants than any other. We’ll sort the Forbes Travel Guide rated restaurants in Las Vegas by star or recommendation. *AquaKnox closed earlier this year. Wynn Las Vegas is home to more restaurants rated in the Forbes Travel Guide than any other casino-resort in Las Vegas. 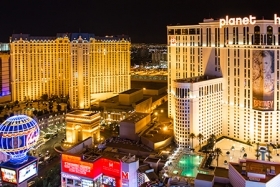 Seven of the 18 restaurants that received 4 star or 5 star ratings are spread between two hotel towers at the same casino in Las Vegas. Five of the restaurants on this list are in the Wynn tower at Wynn Las Vegas. Two more restaurants are a short walk away in the attached Encore tower. Beyond the great ratings, the variety of restaurants at Wynn is impressive. Just about every cuisine ranging from Asian food to a classic steak house is represented in the dining options at Wynn Las Vegas. There are no true bargains on this list. You’ll enjoy a great meal at these restaurants but you’ll pay for it. There’s nothing wrong with expensive prices but it’s something to know before dropping everything and heading to Jean-Georges Steakhouse for a short rib that is so good you might get a little weak in the knees. IT’S SO GOOD! You can see all of the hotels, restaurants, and spas at the Forbes Travel Guide.